I’m a huge fan of this kind of game: Story-driven experiences that let you “Live the Movie”. 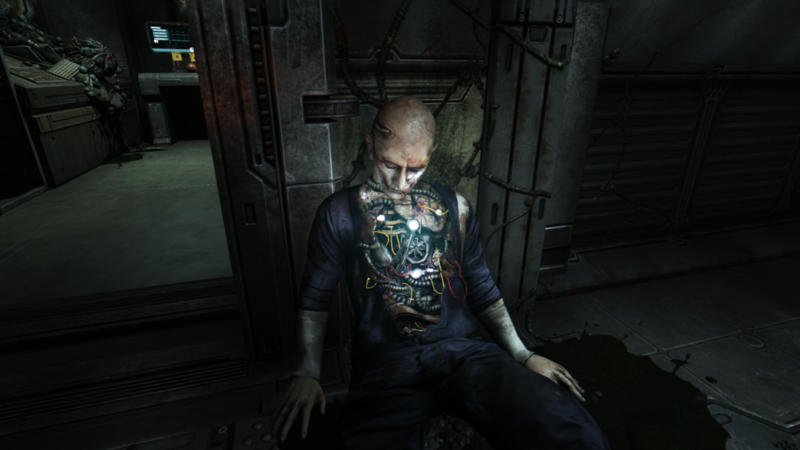 If such a game is in any kind of horror or Sci-Fi setting, all the better and SOMA just so happens to mix both of those. 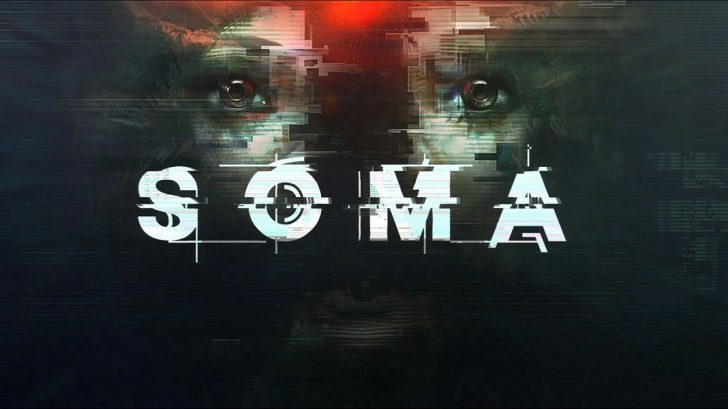 I had high expectations going in, as I have many friends speaking highly of this game and I’ve enjoyed all of Frictional Games’ previous creations. 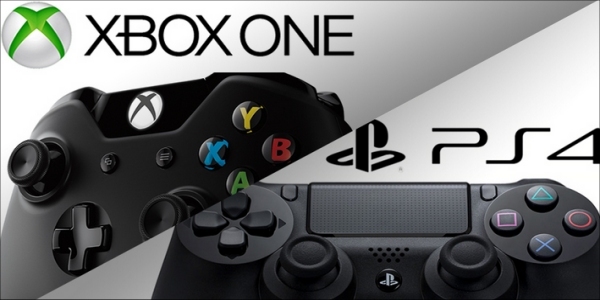 Now that the game has been released on my platform of choice, the Xbox One, let’s see if the game manages to live up to its reputation. I’ll also be playing the game in the brand new SAFE MODE: in this mode it’s impossible to be killed by enemies and their behaviour has even been modified to alter the experience. I think this is a really great addition as I loved the creepy atmosphere in Frictional’s previous games (Amnesia & a machine for pigs) but I really disliked having to play cat and mouse (me being the mouse) with the monsters. 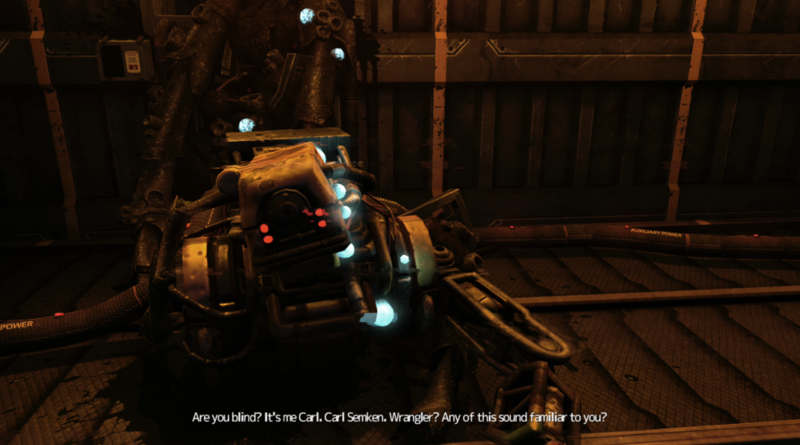 Having a mode like this allows the player to experience the story without having to worry about losing any progress. Now, normally I start my review with what I think of the story, but I’m afraid this time around it’ll be difficult to dive into that without ANY kind of spoilers. 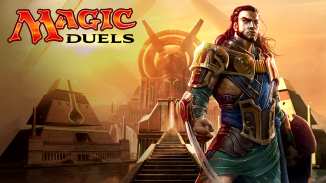 I’ve been blessed to be able to play this game spoiler free and I’d like my readers to have the same experience. So please, skip past the story part if you want a blank start. SOMA takes place on the bottom of the ocean, 100 years from now. A cataclysmic event has caused a group of people to flee to a scientific installation on the ocean floor as the surface has become uninhabitable. Our protogonist, Simon, awakens there after what he thought was a routine brainscan without any clue about what is going on. Bit by bit he discovers that he’s in the future and his state of being isn’t exactly what he’s used to. Humanity and the planet earth is dying and in a final attempt to save mankind, they’ve developed a method to upload their consciousness to a computer. Some of them got uploaded to robots however, by an AI called WAU and the first of these you meet don’t even realise what has happened to them and even perceive themselves as still being human. Seconds later I accidentally killed Carl. May he rest in pieces. It doesn’t take long before you realise that this is exactly what happened to you: you were actually the first person to be scanned this way and the WAU had uploaded your ‘soul’ into a new experimental ‘body-suit’. You also meet Catherine, a scientist who’s goal is to save mankind by shooting an ARK into space, containing all scanned humans. She wants to do this because the safety of said Ark can’t be guaranteed in its current location: It needs power to run and the planet is dying. When you meet Catherine she’s inside a robot body herself and to take her with you, you have to uploaded her unto a portable omnitool. The dialogs with her reveal more about what has happened, but she can only speak when plugged in to other devices. This created a very interesting element for me, in that I always looked forward to being able to talk to her to escape the lonely world I found myself in. Simon and Catherine also have a lot of talks about what it means to be “alive” and the psychological impact of existing outside of their original bodies. 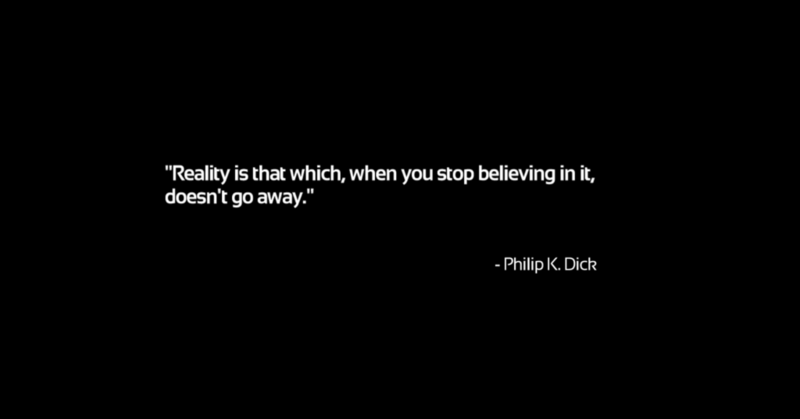 You see, when the scan happens: you copy your consciousness. The original doesn’t cease to exist. Many people can’t cope with the idea of there being two of them, so suicide quickly became a go-to option, choosing to have their digital self do the ‘living’ from now on. I don’t think anybody went into this game expecting a happy story. It’s weird then, that Simon seems to understand that he’s not the original version of himself (who died about a 100 years ago) but at the same time he constantly seems to forget how all of it works. If you pay attention, the game’s biggest plot-twists aren’t don’t exactly come as a suprise (but this in no way deteriorates the quality of the story-telling). The end-goal of the game is to upload yourself and Catherine unto the Ark, while escaping the monsters the WAU unwittingly created in its own attempt to ‘fix’ mankind. 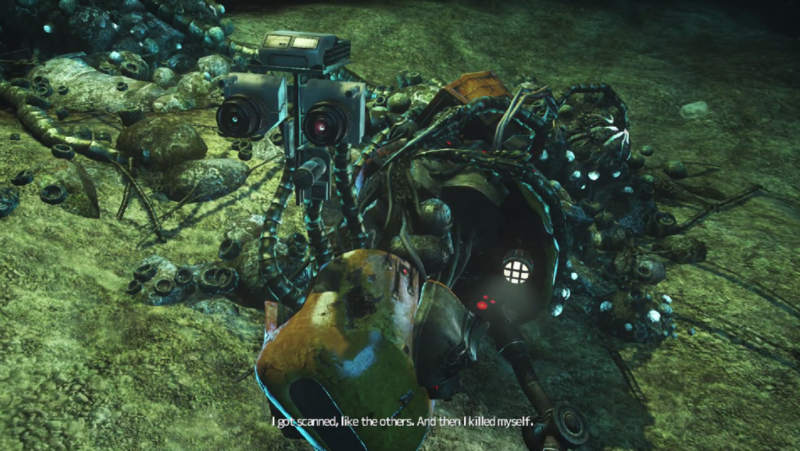 Frictional games has been able to steadily increase its games’s graphics and it seems to have really taken a leap with SOMA. While this won’t be the prettiest game you’ve ever played (regardless of which platform you’re playing on) it still manages to put out an amazingly eery atmosphere. Especially the modifications made to humans and wildlife alike are all terrifying and fascinating to behold. Playing in SAFE MODE also made me feel less rushed to continue onwards, so I often found myself exploring to see if there were new curious sights to discover. The sound direction is also top notch and you’d be doing yourself a disservice if you play this without headphones or a surround system. The approaching footsteps or moans of an enemy trigger your fight or flight reflexes to usually give preference to the latter. The voice acting is also impressive as you hardly don’t have any face to face interactions with humans: the voices are all you have to interpret emotions. Catherine herself is perfecly voiced and whenever she’s silent or you hear hesitation, it often says more than a thousand words. Remember what I said earlier about exploring? Besides following visual queues, you’ll also discover some pretty interesting (if not disconcerting) scenes if you follow your ears. 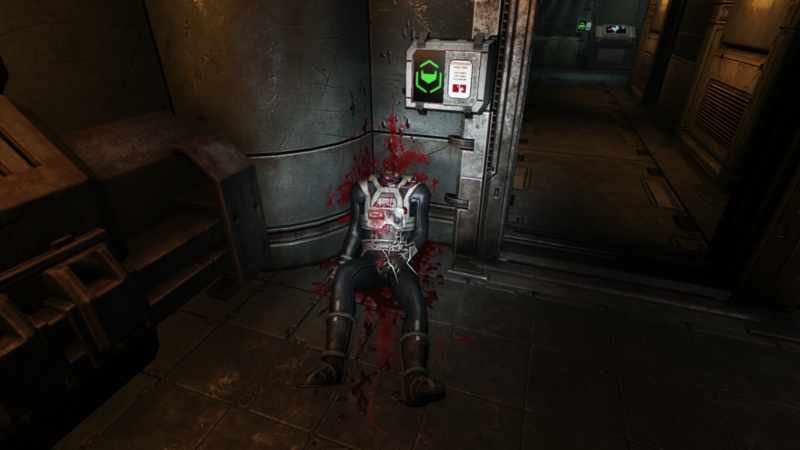 Like Amnesia before it, there is no real combat in SOMA. Your only option are to flee or to hide whenever an enemy is in your way. But I really appreciated the SAFE MODE in that you didn’t feel compelled to run like a headless chicken at every encounter: this often resulted in getting lost or just spending too much time waiting for an enemy to pass by, killing the pace of the game. …and then I met Edith Scissorhands. 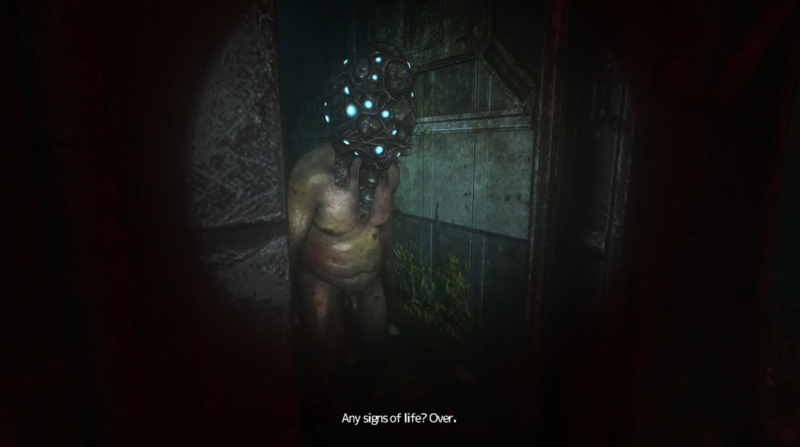 SOMA is more of an interactive story being told, with some minor puzzle solving and “find the missing piece”-sections in between. What really impressed me was how the level design was done: it has some large environments on the ocean floor and a lot of sections with countless corridors and yet I never found myself to be lost. This is a perfect testament for how the use of light, visual queues and sound design all come together to create an immersive experience that doesn’t frustrate the player at any time. 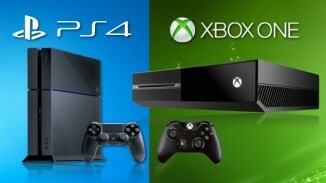 My hat goes off to the developers for this and I do hope that any new games they bring us show the same level of care. My only minor gripes with the game were the fact that it crashed on me twice (but during recordings so I don’t know if that played any role) and that my very first savefile was bugged and the tracer fluid was nowhere to be found (your first task in the game). I did reload my savefile multiple times after this and the fluid was in a different location every time, so there is a possibility that I just missed it. But I was sure I had checked all possible locations + the audio didn’t seem to play the correct dialogue. Luckily this only happened in the opening hours so I’m willing to forget about it and don’t hold it against the game in the final score. 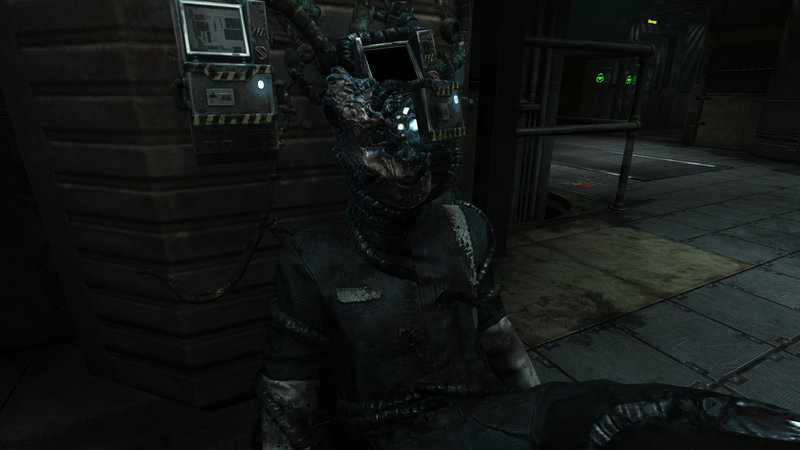 SOMA is above anything else, an experience. The game’s story is bound to stick with you for months after playing it, just like a great movie. It’s pacing is damn near perfect and any fan of the genre should hit themselves over the head of they continue to ignore this one. Story-wise it’s one of the best games I’ve ever played and one that I found myself discussing even with friends who don’t care much about videogames. It’s newly added SAFE MODE is something that any game in the genre should consider as I found it a breath of fresh air as it prevented any form of frustration. Don’t miss out on this game! If anything, it should be getting MORE praise than it has already received.